Sydney has been kind to us in terms of weather, especially over the weekends. Last Saturday the wife and I decided to head to the famed Darling Harbour and boy were we impressed. Rows of cafes and restaurants along the wharf with a view of the harbour, loads of open spaces, brilliant views and an IMAX theatre! We walked along the harbour and I was busy snapping pictures all the while. 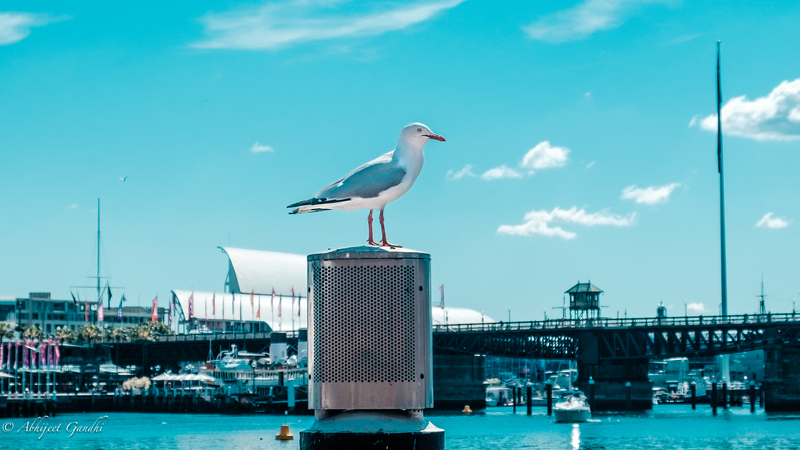 Owing to the proximity to the ocean, the city especially the wharfs are packed with seagulls. Obviously DH was no exception. I did manage to capture a few shots of the seagulls and a few did turn out great. One even made it to flickr! This particular seagull was perched in just the right (no pun intended!) for the theme and so I decided to go with it for the theme.